Glouster is a picturesque sea-side community in Massachusetts, and was the setting for the book and movie "The Perfect Storm". Lobsters and fishing are the basis of the economy, and much of the town looks like a Norman Rockwell painting. 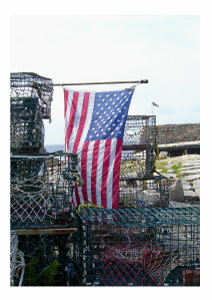 A bit of Americana - the flag set amongst a stack of lobster traps. 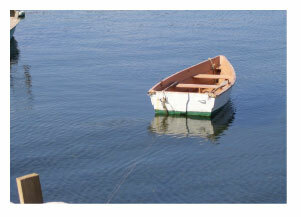 A lone wooden rowboat in a small bay. I didn't realize that wooden rowboats were used much these days (most are fiberglass) - these reminded me of summers spent at a lake when I was a kid.